I start most of my race reports by telling you how beautiful the course is, but they always are! I choose races that look epic and challenging. The beauty is the payoff for the hard work. Hellbender was definitely all that and then some. I had Hellbender on my radar after hearing about the inaugural year of the race last year. When Stephanie and I began talking about races for our 2019 calendar, we discussed Hellbender and were eager to sign up. I don’t judge a race by swag, but if you do, this race won’t disappoint, but there’s really so much more. The race starts in Old Fort, North Carolina at Camp Grier. From the moment we arrived, it had a cozy, welcoming feel as volunteers greeted us at the large pavilion. Many of the runners stayed in the small bunk houses that circled the pavilion, and as the runners began to gather, it had the feel of meeting your new best friends who you were going to spend the next several days with at camp. We caught up with old friends and met new ones while we waited for the pre-race meeting to start, followed by a great pre-race meal. We camped in a nearby field. It doesn’t get much better than sleeping very close to the start of a race! We had one friend coming to help crew us part way through the race, and possibly pace, but we were prepared to be mostly self-sufficient. We knew this would be a challenging race, but felt well-trained and ready. Stephanie had been fairly sick 10 days prior to the race and we weren’t certain she would start until just 5 days or so before the race. I had been dealing with Piriformis Syndrome for many months, and I always stand on every starting line knowing that anything can happen and there’s no guarantee of a finish. I don’t take a 100 mile race lightly and always respect the distance. Now, I’m an admitted elite geek! I love to follow all the ultra runner elites, read articles about them, follow them on social media, listen to them on podcasts, and follow the races. I admire their God-given gifts of speed and strength. I’m especially inspired by the masters-level runners that are still racing strong, and admire my coach, Meghan Laws “The Queen” who not only guides me, encourages me but believes in me. My gift is not speed. I’m a fast runner only in my dreams. But what I possess is toughness and determination. I pick races I really want to run and embrace them. We made it to the top of Heartbreak Ridge and summited Pinnacle before finally heading down. We knew for certain we had our work cut out for us. Before long, we were at the Blue Ridge Parkway water drop and headed down towards the second aid station where I knew a couple of the volunteers. They were the only friends that I knew would be at the race and was already looking forward to a familiar face. Getting hugs and words of encouragement from Kris and Kim was just the boost I needed. As it turned out, I knew people at almost every aid station and they were calling out my name and cheering me on. Each aid station had a large number of extremely helpful volunteers and always offered us a great variety of food choices. We were waited on, encouraged and taken care of like we were the only runners in the race. We went up the Snooks Nose climb to Green Knob, which we were told was the steepest climb of the course, and then back down to another aid station. As we came into Neals Creek aid station, we were surprised to be greeted and encouraged by Aaron Saft, the race director. At this point, we were probably the final runners to get there, but were well ahead of cutoffs. We then began the climb to the summit of Mt. Mitchell. It proved to be a very tough and technical climb that was beginning to eat away at our margin on the cutoffs. When we finally summited, we were able to take in the incredible view before checking into the aid station there. Ken, who had come to help crew for us, met us as we reached the summit and our spirits were lifted just to see him (he couldn’t crew us here, but did greet us). As we came into the aid station we were again met by the race director. We had lost some time on the climb and were now only 20 minutes ahead of cutoffs. After the long hard climb, we were thinking the downhill would give us a chance to gain back some time (I should have paid more attention at that pre-race meeting). I was so surprised to see Aaron once again and asked why he was there. He said that he was there to check on us and see how we were doing. He was there for all the runners at the back of the pack. It was probably one of the most encouraging things I’ve ever had an RD do. Aaron told us that we probably would not be able to make up any time on this downhill section, but we would in sections after the next aid station. I assured him that we would make it to the finish and hoped to get a hug from him. He promised to give us a hug and a he’d hand us a buckle when we got there. When he said it, you knew how much he really wanted to see you finish. The downhill from Mt. Mitchell had a few more climbs and very technical, rocky downhills, including a rope section. It got dark, and with the wet trails, it seemed like the longest and toughest downhill section. We knew we needed to get to the aid station and make the cutoff but we were getting very nervous about it. When we finally got there we were sure we had missed the cutoff. This time I was surprised to see my friends Brad and Jenny. Brad quickly told me that they were going to let us keep going if we wanted to continue. Yes! We wanted to! They told us we had to go roughly 22 miles in ten hours to make the next cutoff. Brad assured him that we could most definitely do it. We still had a long way to go, but we were full of hope and began the climb up the Buncombe Horse Trail, when we passed another runner. We were no longer DFL. But if we thought the climbs got easier after Mt. Mitchell, we were wrong. It might look like it on paper, but you have to account for how you might be feeling at this point in the race. We had wet feet all day, and the steep and technical downhills had begun to take a toll on our feet. This quickly became a low point for us as we fought hard to stay moving and make up some time. Then, Stephanie’s light went out. As we were rushed through the previous aid station, we had not gotten extra batteries. We somehow managed through some very wet and muddy sections using only my headlamp as our guide. We were eager to get to the aid station, not only to put on our long pants and warm up, but we really needed to borrow a headlamp if we were going to make it. The volunteers were so happy to help us, give us warm food, coffee and lend Stephanie a headlamp that no doubt saved our race and allowed us to keep moving. We began to move faster through some “easier” sections and surprised the volunteers when we came into the next aid station an hour and 45 minutes ahead of cutoffs. With Ken bringing our drop bags to us, we were finally able to take time to change shoes and socks. We couldn’t pay too close attention to our feet but knew how they felt, and we had roughly 30 miles to go. Ken began pacing us for the last 20 miles. It was nice for us to share those miles and some final tough climbs with him. He got to experience our race but only a small amount of our suffering. We had managed to pass a couple more runners in the final downhill push and finished 2 ½ hours ahead of the final cutoffs. As promised, Aaron gave us a hug and handed us our buckles. As we sat down, the aid station volunteers began to wait on us hand and foot. Then Aaron came over to us and handed us each a special gift, telling us we had both won our age group award. We started out just wanting to finish this beast of a race, but walked away with so much more. The next morning, I walked over to the pavilion to see if Aaron was still around to thank him once again, and thank the volunteers who were still there. Aaron gave us another hug and said he had one more thing to give us and soon came back with gift certificates for a pair of shoes! We said thank you and final goodbyes. We may not be gifted with speed but we are both tough, determined and never give up! As AJW would say: “Gritty AF”! 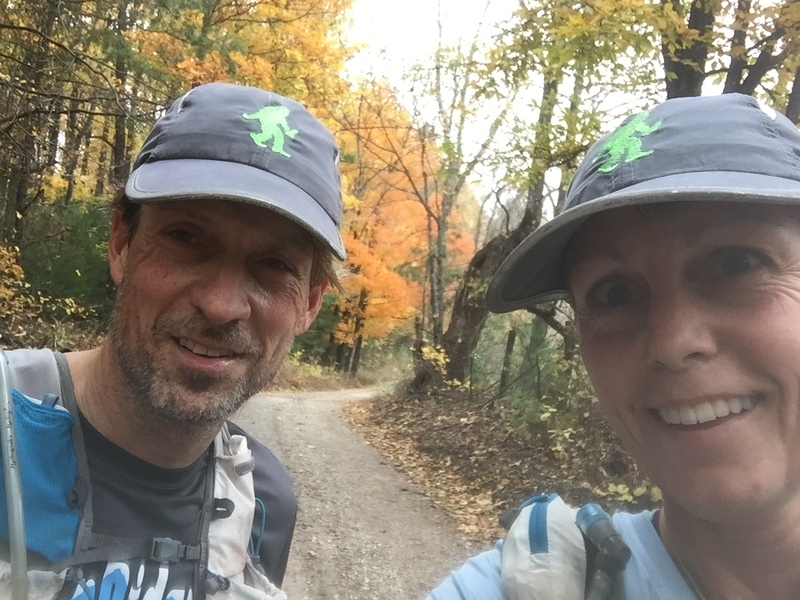 This race, the Hellbender 100, is the Beast Coast at its finest! I’ve been wanting to run an Aravaipa Race for a long time now. They seem to have so many great races and I really wanted a chance to experience one for myself. As soon as the 2019 Black Canyon 100K race opened for registration, I talked several of my local running friends into signing up and join the fun. When I got a chance to meet Jamil Coury at Western States in 2018, I told him we had a big group coming from Georgia for the Black Canyon race. A lot of us signed up, but many didn’t actually make it to the race, due to injuries. We flew out to Phoenix on Thursday before the race so we could settle in and have Friday to rest and go to packet pickup. We had a good dinner and went to bed early for the early race start. Due to heavy downpours that occurred on Thursday, they had to re-route the course at the last minute. Huge shout out to Aravaipa Running for all the work that went into that and how smooth the whole race went. They have tremendous volunteers with very well organized aid stations. Runners had plenty of options, no matter what your diet might be. Because Black Canyon is a point to point race (which, by the way, is one of my favorite race types), we were shuttled to the starting line. The temps were pretty cool but not crazy cold. We left our drop bags, used the bathrooms and started the race right on time. Black Canyon is a race that easily lulls you into thinking it will be a fast and easy run. It essentially starts with a lot of very non-technical trails that are mostly downhill. Many runners might find it difficult to keep from going out too fast and crash later as the day warms up. Stephanie flew out from Knoxville and we once again got to enjoy the trails together. She is much better at setting a manageable pace at the beginning than myself. I’m one of those runners that goes out too fast and doesn’t settle into my own pace until much later. I have been dealing with Piriformis Syndrome for several months and while it is much better, there was the real possibility of it being a long painful day. I knew I had to let Stephanie lead and go easy. The start turned out to be windy and cold, with a little rain, but it soon cleared away into a very beautiful and comfortable day. I was enjoying my morning and the beginning of the race until somewhere around mile 10. I began to get that uncomfortable feeling in my Piriformis I had been dreading. I was also beginning to have trouble keeping pace with Stephanie, although I could see she wasn’t far ahead on the beautiful winding trails through the desert. I chatted easily with those around me and enjoyed the beautiful Black Canyon Trail. Somewhere before mile 20 and the Bumble Bee Ranch Aid Station, I began to think I needed to tell Stephanie to leave me and thought my day might be much rougher than I wanted it to be. Luckily, as it often happens, you get a little renewed at the aid stations. At this aid station, I ended up getting to meet, and got help from, a Facebook friend who I knew from Ginger Runner Live! That seemed to change my mood. Stephanie and I chatted and I told her my fear of keeping up with her, but she assured me she didn’t want to go any faster. I left that aid station feeling good, and Stephanie and I enjoyed some beautiful views and took a few pictures in the next section of trail. Running through the desert is so different from our normal runs so we both took it all in. I think we both felt a little unsure if we would be able to finish with a sub 17-hour time, which is the requirement for it to count as a Western States Qualifier, but we didn’t discuss those thoughts. Our goal was to move forward. We are both solid runners and hikers, and this course was very runnable. After we got to the Gloriana Mine Aid Station (mile 23), the trail got much more technical with lots of rocks. Most of the race was on single track and often had a good bit of rocks, but those are some of my favorite trails. As long as we kept running steady, my Piriformis remained uncomfortable but not unbearable. I wasn’t as fast on the hills, but with Stephanie pulling me along, I seemed to have my moments of rallying. It was also fun in this section as we began to see the top runners racing for the Western States Golden Tickets and cheer them all on. We made it into the Black Canyon City Aid Station (mile 35) where the reroute of the course began. At this point we had to do a 4 mile out-and-back section before we would head back to the Gloriana Mine Aid Station and back again to finish. I saw Michael and Rebecca Richie just before getting into the Black Canyon City aid station who said David was behind them at the aid station. Stephanie and I made a quick stop and we headed out for our 4 mile out-and-back. I didn’t have time to look around and say hi to David. A mile or so out from the aid station we ran into John, who was headed back into the Black Canyon City aid station. He also updated us that David was roughly two miles ahead of him. So everyone was doing well. Stephanie and I began to set small goals for ourselves. We wanted to be back and leaving the Black Canyon Aid Station by 5:00 pm. We kept moving and were happy to make our goal. We now began the 11 miles back to Gloriana Mine aid station, and then return the same 11 miles back to the finish. There was a lot of climbing and some big hills midway through this section. We just broke it down into small pieces and took it one step at a time. About 4 miles or so from the aid station we passed Michael and Rebecca again. They told me David had slowed down but they were doing great and everyone was in good spirits. We kept our eye out for David and John as we were on the last section leading into Gloriana Mine. We finally came across John who again said David was in front of him by a couple of miles. In the dark, we had somehow missed him but that wasn’t so surprising. This section became a little tough in the dark and then you were constantly passing other runners on the single track. We tried not to shine our lights in the other runner’s faces but it was a constant passing game that seemed to slow us down. This was one of the downsides to having an out-and-back course with 700 registered runners! We reached our next goal of getting to the aid station by 8:00 pm and were happy to be headed back to the finish. We now knew we would easily make the sub 17-hour time we wanted. Stephanie continued to lead us at a good pace through the technical trails and back to more runnable dirt road sections. We were able to dig deep and run much better through this section than we had the previous time. We both seemed motivated to not just finish but finish strong. We were thrilled to finished in just under 16 hours and meet our goals. I would like to think we worked together, but I know it was all Stephanie. She pulled me along and paced us the whole race. We’ve covered a lot of miles together over the last year or two, and hope we have many more miles and adventures together. This was a very well run race by Aravaipa Running and I hope to do another one of their races again sometime soon! This is probably a race I really had No Business doing, and I say that in all sincerity. I actually signed up for it when registration first opened up in 2017. That was long before I got into the UTMB lottery, which I never dreamed I would get into. I had run part of these trails with my friend Stephanie when we ran Dark Sky 50 miler together in May of 2017. That was the first year of the No Business 100 race and I was all over it but timing wise I couldn’t run it that inaugural year. Knowing the 106-mile UTMB in August would be a huge challenge, I decided not to withdraw from No Business, but wait until after my race and see how I was feeling. I must say that my coach was not thrilled about me running again so soon, because her first concern was my recovery from UTMB. Nonetheless we made a training plan for me to recover well off UTMB, do a couple longer runs and taper way back before the No Business race. In return, I promised that if I wasn’t feeling completely recovered or my legs were still not there, then I would pull the plug and not run. Let me also say something here about using a coach. I have loved my coach, and I use one because I trust them and feel strongly about the relationship we’ve developed. If she would have told me not to run this race, I wouldn’t have liked it, but I would have respected her judgment. Recovery is important to me (and my coach) and not just physically but mentally as well. I don’t spend money on a coach and then not listen to their advice and guidance. One of the most important things to me about a coach is that she believes in me. As runners, it’s nice to have friends and family say how great we are and encourage us towards our goals. However, a coach is much more intimately acquainted with us and our abilities. When a coach believes in you, it’s very empowering! Thank you, I love you Meghan! I’d lined up crew for No Business back in January, talked to Stephanie some about pacing me, and honestly didn’t give a lot more thought to the race. UTMB was my A-race and No Business did not get much attention until after I came back from Europe in September. That said, early on I did try talking her into signing up and running with me, but being the smart person that she is, Stephanie didn’t fall for my peer pressure. Then just a few weeks before the race, Stephanie gave in, and No Business 100 became her business as well. We already had crew, didn’t need pacers, or a place to stay; we were set. We were looking forward to a beautiful, “easy” race and not having to fight cutoffs like at UTMB. Of course, I’ve learned from experience that when a race gives you longer than 30 hours to finish 100 milers, it’s because you need that time. They aren’t just being nice. Stephanie and I both went into the race feeling confident in our recovery and excited about the race. We had a solid plan and were ready to spend some more trail-time together. An unexpected rain fell much of the night before the race, so when we got up in the morning it was wet and chilly. We made small adjustments to our gear and what we would carry in our packs. The race begins in Blue Heron, Kentucky, also known as Mine 18, a former coal mining community on the banks of the Big South Fork of the Cumberland River. Tipple Bridge at the train depot marks both the beginning and the end points of the race. The course is one large loop, starting in Kentucky at Big South Fork and going into Pickets State Park in Tennessee and then back around into Kentucky. The race began on time at 6am, so we spent the first hour or so in the dark. It was a large crowd that narrowed right onto the long Tipple Bridge and an instant conga line ensued. The first few miles were a nice rolling single track and enjoyable to run. Stephanie and I began and ran comfortably for the first 15-20 miles in the upper-middle portion of the pack. We spent a few miles with our friends, Kirby and Caitlin, who went on to run at their pace after we began to take walk breaks on a long fire road section of the course. The road sections were very hard on our legs. Stephanie and I talked about how real the UTMB legs were, leading us to set a more cautious pace. For those who like numbers we ran our first 30K in about 8:15. When we saw our crew around 25 miles we were told we were about 1.5 hours ahead of the cutoff. The next time we saw our crew was in Picket State Park (42 miles in). There we took a few more minutes to change into dry cloths, got our headlamps out, and changed socks and shoes for the only time during the race… we also took advantage of the restrooms. Stephanie had started having some minor stomach issues, but they weren’t causing her to slow down. We’d maintained our 1.5-hour cushion on cutoffs and were soon off again feeling refreshed from our change of clothes and would see our crew again around mile 61. Stephanie’s coach, Alondra Moody was working the Bandy Aid Station at mile 61. When we arrived there, Stephanie and I were now only 30 minutes ahead of cutoffs. We needed to quickly take care of a few things and head back out. Alondra helped Stephanie get something for her stomach issues, hoping to settle things down for good. Once we were back on the trail, we began talking about how we could have possibly lost the hour. Looking at the cutoff sheet now, it was night time so normally you do begin to go slower. In that section we had just under 6 hours to cover approximately 20 miles, hitting three aid stations along the way. Again, for you math nerds that’s about an 18-minute pace, at night including AS stops. Even with quick stops you now have about 17-minute pace, at night with lots of climbing. Wherever our time went all we could do was get to the next AS 5 miles away and work with the time we had. Stephanie began to calculate that we had 14.5 hours to finish, as the race was really a 104-mile course. In short, we had another 44 miles or so miles to go in 14.5 hrs. Getting into the next AS at Grand Gap, there was a huge crowd with lots of people we both knew. Immediately we were asking about cutoffs… still just 30 minutes. At this point, Stephanie and I were stressed and frustrated. Chasing cutoffs is not a fun way to run, and we had felt we were running solid – pacing well, running all the flats and downhills, and only slowing down to climb. Having just completed UTMB 6 weeks prior, we were thrilled with our pace. We felt like our legs were good. Neither of us had foot issues to speak of, and only Stephanie with some stomach issues. If you are not a back of the pack runner you might not understand how it feels to run from one cutoff to the next, it’s a very stressful thing. On the one hand you are trying your hardest, not gaining on cutoffs. You don’t want to be cut, but you also begin to calculate how long until you slip up and miss. At that point, all your hard work is snatched right out from under you… STRESS!!! We had a 6.5 miles loop to do and back to that AS. Due to the increasing stress, challenges of nighttime navigation, and Stephanie’s stomach issues, I took over as lead runner pacing us during the night hours. Stephanie had paced us and pushed us well during the daylight, and now it was my turn to try my best to keep us moving at a good pace. During the last section of the loop Stephanie began to fall behind, but I kept trying to push us both. For a while I’d assumed Stephanie was the person running behind me. Once I stopped to check on her, I realized she’d fallen off and another runner was there instead. He advised me that he’d seen Stephanie some distance back throwing up. Being close to the finish of the loop, I was concerned that Stephanie would not be able to continue for long. I pushed ahead to the AS to get to our crew. It was the middle of the night and I knew if I continued the race, I’d be on my own. I wasn’t sure how much farther I could get before being pulled for missing the cutoff, but I knew I couldn’t just quit. My legs felt great, my feet were fine, my stomach was fine, we’d been eating good and running well to this point. Short of Stephanie continuing I was ready to keep moving. She soon came into the AS and told our crew, she was done. I was quickly headed out with still only 1/2 hour to spare. I would see our crew again in 7 miles. Alone, but more than able to run strong, I kept a solid pace. I ran as much as I possibly could, determined to make up time. One-by-one I passed people along the way; 10-12 runners in a 7-mile section. I got to the next AS thinking for sure I had made up time and was going to be OK. To my surprise, I arrived only to hear that I now only had 2 minutes to spare! All I could do was keep going. Now 80 miles into the race, there are 24 more to go. I’m unsure how much time I have to reach the next AS cutoff which is 9.2 miles away, so I grabbed food and ate on the trail. I chatted briefly with a guy I met in the race earlier in the day. He didn’t have any ideal about the next cutoff time and soon ran ahead and out of sight. I didn’t see any lights behind me after that. While I was determined to run solid, this section of the course was very technical, rocky, and now muddy, and messy trails. Rain had been falling for hours but now it was raining much harder. At this point, all I could do was focus, keep moving as fast as I could. Knowing that the odds were not in my favor, my hope of finishing were quickly fading. After being by myself for some time, I finally see someone behind me… soon I realize it’s the Grim Reaper and I think I might join Stephanie by throwing up! When the Reaper gets closer to me, she lets me know that the cutoff at the AS is 9:00. The bad news is that I’m on pace to reach it at about 9:15… now I’m really sick! I pushed harder, refusing to give up yet. It was so frustrating. I felt great, was running well but just could not get ahead. Then we came across another runner, I passed him and kept pushing. I might miss that cutoff but darn it, I’m not stopping until they stop me. We finally got to the water drop and I was thinking it was another 2 miles probably to the AS. The sweeper had no idea where we were or how far it was when I asked her. Another quick look at my watch and I knew it would probably take a miracle. I was still thinking it would take me until 9:15 to get there. Then the worst climb of the course is straight in front of me. It’s very steep, no end in sight and to make matters worse of course it’s wet, slippery and covered in rocks. Not an easy climb at 86 miles into a race. Now how do they expect me to make these cutoffs with this stuff? Even the 9:15 is looking bleak but I can’t give up. I knew my friends, John and Rebecca (who had been our crew at UTMB,) would be at this AS so I began looking forward to seeing them. I know I can finish this thing. I pass another guy as I continue up and up the hill. He’s sitting on a rock looking in rough shape and I feel his pain, but I can’t join him. I can’t lay down and quit. Just before the AS one of the workers was there on the road, I think he may have been the captain. It was between 9:15-9:20 and certain I’m well over the cutoff. The first thing I asked was if there was any grace here. I told him how it was a rough section, but I pleaded that I knew I could finish it. When he asks how I’m feeling, I assure the captain that I’m feeling great. He asks for my number and trots ahead to the AS. When I arrive, there are John, Rebecca and the workers cheering for me. They want to know if I have a drop bag they can grab for me and what else I need to get out of there in 2 minutes. I drank some Coke, John put my headlamp in my pack for me, and Rebecca got me some food, and starting walking me out of the AS. The AS captain was told by the race director that the cutoff could be extended 10 minutes. Turns out the cutoff was 9:20, I was the last runner through this AS at 9:24. With 7.8 miles to the next AS, I have been assured by Rebecca that the worst is over, and I can finish the course. But, I have to get to the next AS by 11:55. The section begins with some good easy running and I’m gaining confidence that Rebecca was right. But over time the mud, creeks, slick bridges, it all begins to take its toll. By now I’m over 90 miles into this thing, and where the heck is that Aid Station? Just when you think you’ve got the race in hand, along comes another long endless climb! I know I must be close, but I just don’t know how close I am. I’m now too afraid to look at my watch. I swore when I got through the last AS I would prove I could get this race done and not miss this cutoff. At last I see it, I’m afraid to look at the time, but I have to… 11:48, I was never so relieved! I’m asked for my number (37) … “We’ve been waiting for you Number 37, you have two minutes to get out of here.” Now who can’t do the math, I had 7 minutes but I wasn’t going to argue. Now an easy 2.2 miles to the water stop at mile 99.3 which has a cut off in 1.5 hrs and yes they tell me you do have to make it before the cutoff. So here’s where all that time was hiding. I easily make it there in 30 minutes with loud music playing and a whole AS and not just water. Super nice guys happily chat with me, getting me some broth and coke. Finally a huge sigh of relief. The long fight is nearly over. I finally know I’ll make it. I’m quickly on my way with 4.8 miles to go with around 2 1/2 hrs. I’m so happy, but my feet are sore, those rough sections have taken their toll. I’m no longer stressed and can enjoy the last 4 or so miles. It was sweet when I finally crossed the bridge to the finish… a smile on my face and friends there to cheer for me! Some finished before me, some left unfinished business out there, but they all celebrated my finish. It was bittersweet as Stephanie greeted me. We began No Business expecting to cross the finish line together, like UTMB. I have no doubt we will finish more races together. Final numbers for those of you still geeking out over them, 96 runners started the race, and 39 of us finished it, only 7 were woman, I finished in 32:21 and was DFL! If you are a real dork (David), last year they also had 39 finishers out of 96 runners who started. If you are reading looking for more insights, details and information about this race, keep reading if not, carry on. This turned into a much longer report than I had imagined. So, let me share some after thoughts with you about this race and the course more specifically. 1. The first year of the race, 2017, it was run in the clockwise direction with this year being run counter-clockwise. A special buckle is awarded to those completing the race in both directions I think that prize brought back several return runners, along with runners who had some unfinished business from that first year. If you are reading this looking for information to run the race, keep in mind this report is from running it in the counter-clockwise direction. Looking at the finish times and talking to people who ran it both years, it might indicate that this was the harder direction. 2. It’s an absolutely beautiful course! If you want to run some of the most beautiful trails in the Southeast with rock overhangs, arches, lots of creek crossings, endless little bridges, some very technical sections, and lots of single track, you want to put this one on your list. The overall cutoff was 33 hours, and I would not be surprised to see them extend it in future years. It’s still a new race at this point and they are still working on making small adjustments. Believe me, they do want you to finish! 3. Your feet are going to get wet. No matter which direction the race is run there are lots of water crossings and you will get wet. The bigger ones are towards the end of the clockwise direction and the direction I did it, they were more in the first 1/2 of the race. I use Bag Balm and coat my feet before putting on socks. I did one shoe change and recoated my feet with Bag Balm at mile 40. Because of the rain, mud and constant creeks my feet stayed wet. My feet were in really good shape at the end, but I can’t promise what I did will work for you. Some people use Trail Toes and other products. This is just what I did and it worked well for me. Just so you know, you will have wet feet. 4. If you live close enough be sure to try and run some of the training runs the RD’s puts on. I can imagine that the more familiar you are with the course, the more helpful it would be. You can also run Yamacraw 50K which is held on some of the Kentucky trails, or Dark Sky 50 Miler which covers some of the Tennessee section. The course was fairly well marked at turns, lots of arrows and flagging, although I would say not heavy on the confidence marking. Once on a trail that didn’t turn off, it wasn’t overly marked. I think a few people may have complained and that may change in future years. My experience was you need to keep a close eye out for the markings especially late when you are tired. One missed turn can cost you time you may not have to make up. 5. Study the AS cutoff charts… a big fail on my part. I didn’t go in with a plan, just crew at five places. We had a cutoff chart but never really studied it or looked at it until we started running closer to cutoffs. It might have help to pay attention sooner to those. 6. If you like having pacers, you can pick them up as early at mile 40 I think. An extra set of eyes for trail markings and someone to keep you moving if you are a mid to back of the pack runner could be very helpful. 7. The AS are really awesome. Very helpful and upbeat each time you come in. They serve a great selection of food with lots of hot foods later in the race as well. I can’t speak highly enough about how well this race is put on. 8. The swag is also awesome. We got a very nice light weight North Face Hoodie, a buff, a pair of socks and some stickers. They also had additional technical long sleeve shirts you could buy as well as a couple of hat choices if you wanted a hat. Over all I thought they gave you a lot for your money. I might also say that the buckle is also very sweet, and if you finish the course in both directions they give you a second buckle that is very nice looking as well. You can tell they gave a lot of attention to details putting this race on. Wow! It’s hard to know where to start! Emotions are still all over the place at this moment just trying to take in the whole experience. It’s not a race you sign up for and decide to just run it. UTMB is the largest ultra running stage in the world, and there’s just nothing like this one! My journey to the starting line began more than 3 years ago when I earned my very first UTMB points in the 2015 Georgia Death Race 100k. With the growing popularity of UTMB, qualifying for the lottery has become more and more difficult. I don’t want to explain the whole lottery process, but when your name is drawn, it feels like getting the winning Lotto ticket or a payout in Vegas! It feels like you’ve made it, but it’s just the beginning of a very long road. After eight months of training you hope to show up at the starting line in Chamonix, France. But who really dreams of running in France, in one of the largest and most difficult running events in the world? Aren’t those just the dreams of the elites and top runners? Seriously! My friend, Stephanie, and I met at that very first Death Race and we both dared to dream big! We put our names in the UTMB lottery for the first time in 2016 as a team. Under their new team rules, if one got in, we both got in! We were selected into the race in the second year of entering the lottery! We planned our trip, trained hard, and went over to Chamonix, France 6 days before our race. UTMB isn’t just one race. There are 5 different races and distances throughout the week, all leading up to the crown jewel, the 106 mile race! Each race starts at a different town and ends in Chamonix. We spent the week watching the crowds grow and seeing runners from the other races cross the finish line. The excitement for UTMB was off the charts! Our race started on Friday evening at 6pm. We tried to spend the day relaxing as much as possible. Then just 4 hours before the start of the race, we got the alert that the weather had changed and the cold gear kit was required! This was one of my biggest fears because I do not like the cold. We were already carrying so much required gear, so the thought of carrying even more was not what we wanted to hear. Not only was the temperature expected to drop significantly, it started to rain as we headed to the starting line. We were determined not to let it dampen our spirits. My friend, Soon (who we had been hanging out with a lot during the week), Stephanie, and I put on our rain ponchos, headed down to the start with our crew and lined up with more than 2500 other runners! The huge crowds began to clap, runners waved flags from their countries, and we watched it all on the big screen next to us as the announcer hyped up the crowds and runners. The elites were introduced as they each came to the starting line. The noise from the crowds and the excitement grew deafening. Then just moments before 6 pm they began playing the song, Conquest of Paradise, and the feeling was indescribable! I don’t think I’ll ever forget that powerful moment. It all became so real, and just as the song ended, the race of a lifetime had started. Our journey had begun. The race starts with crowds so thick you can’t move, and the streets were lined with people throughout the town for miles as we began running. You knew this was going to be like nothing else you had ever experienced. Stephanie and I grabbed on to one another, holding hands as we crossed the starting line and trying not to lose each other in the crowd of runners. The first 10k is flat and easy, but after that teasing terrain, things got seriously real! The very first climb was like nothing I had experienced – rain, mud, and miles of climbing up a boulder field! It felt like it took hours to get up the first climb. We had trained hard and been given lots of wisdom and advice. One of the biggest pieces of advice seemed to be KFM, or “keep f@#$ moving”! My breathing was so labored and my heart rate was through the roof. I couldn’t imagine how this thing I had gotten myself into would play out. Moving through the first 19 miles to our first crew spot at Les Contemines, we were certain we would miss the cutoffs. Stephanie and I chatted as we headed into that aid station and felt certain our journey was over. At only 19 miles in we were both ready to bow down to Mont Blanc and be grateful for the journey we had. I know it sounds a little dramatic, but I promise you have no idea, this thing is for real. We got into the very busy aid station and anxiously searched for our crew! 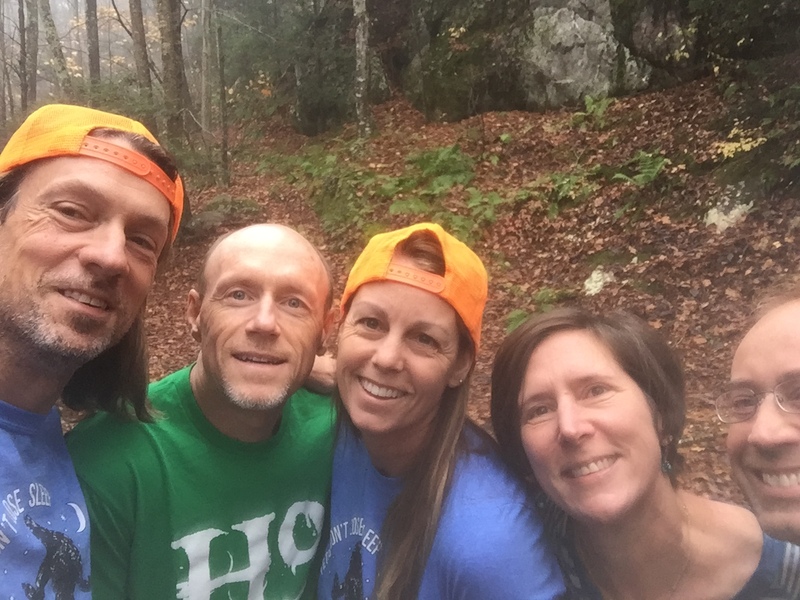 Our crew was Rob Apple (who had 10 years of UTMB knowledge and experience at all their races) and John & Rebecca Storey (friends of Stephanie’s and now mine, from Knoxville, TN). Rob told us we were doing great, we had time, and they quickly helped us get into dry clothes for the next section. It would be 30 miles and the next afternoon before we would see them again in Courmayeur. We had our first taste of reality and it was time to get to work. No time for a pity party, we needed to KFM. That was pretty much how the first part of the race went for us. I knew cutoffs were tight up front and we seemed to stay just ahead of them for the next 30 miles before we seemed to put a little time in the bank. My breathing was labored and my heart rate elevated with each climb. Stephanie seemed to do better on the climbs and helped pull me along. Downhill and more technical sections seemed to be my strength, so we helped each other. We were in it together, but we knew anything could happen. And it would. We felt discouraged at our pace, but each time we saw our crew they would reassure us we were doing great! Rebecca would always tell us we were awesome, and though I don’t think we believed it, we simply had no other option but to accept it and KFM! We were merely in survival mode each time we came into an aid station. Disappointed we had barely beaten cutoffs once again. Often we felt drained with nothing left to keep fighting. Coming out of Courmayeur (mile 50ish) and now well into day two, we thought the weather would be nice, with the worst of the bad weather behind us. Our crew encouraged us to switch to shorts and a short sleeve shirt but we both opted not to. That would prove to be a decision that saved the rest of our race. Rob told us the next climb was the worst. We later realized he lied to us a lot! Good crew sometimes have to tell a few lies. Some tell more than others! You couldn’t really talk to people around you on the trail. You usually had your head down, were in survival mode, and didn’t dare look up. You also could not speak to them because you had no idea what language they spoke. There was always a bond though. Heavy breathing, gasps, and deep groaning that everyone understood. Everyone was going through a struggle that transcended language. When we got to the top of that big climb and started out of that aid station, the volunteers stopped us and made us put on our required sealed rain jackets. They had warned that the weather was going to be cold where we were headed. A couple aid stations later, at Arnouvaz, they would make us put on our required sealed rain pants. We were not far ahead of cutoffs but looked around to see that many of the runners were calling it quits here at Arnouvaz, 58 miles into the race. We were determined not to quit but knew there was a good chance it might beat us before we could finish. We now had 10 miles or so to the next cutoff point and about 4 hours to get there. That normally wouldn’t seem so bad, but this is UTMB! As soon as we were on the trail we could see this huge overwhelming climb before us. With all the people we had just seen give up at the aid station, it now seemed like that might have been a good way to end this thing. It also seemed like more runners were coming down after starting the climb than going up. One thing you get good at is keeping your head down, putting one foot in front of the other, and KFM. We would later agree that the climb up Grand Col Ferrett was the worst climb of the race, but I think that was because it was mentally the toughest. The weather was rough; heading into the night again, rainy, windy, foggy and cold! We were into our second night of the race and were still barely surviving cutoffs. Nothing was getting easier, only harder and steeper! It felt like hours later when we did finally make it to the top. My hands were frozen and cold, it was windy, and I was completely exhausted and defeated. I was also feeling like I was on the verge of being hypothermic. We had two more check points to get through before La Fouly, and still a long ways to see our crew again at Champex-Lac. I had also strained my groin coming up that climb. A warm shower and bed were all I could wrap my mind around at that moment. In the meantime, it was survival mode and I balled up my hands inside my gloves so I could warm them up and feel my fingers again. We were now on some of the better downhill sections of the course, but it was still cold, wet, foggy, rainy and night time. We knew we had managed to stay ahead of cutoffs, but it was definitely the lowest point of the race for me. I knew my groin was at least strained, and that doesn’t sound fun for 40 more miles of tough climbs. We were not far from the La Fouly aid station when we came across a few young women (we were now in Switzerland). The crowds all along the course were yelling and cheering “allez allez allez” or “bravo” but these young ladies looked at my bib and hollered out “Stay Strong, Make America Proud”! Dang it, why did they have to say that? I had almost made up my mind that with my injury and the weather, I was dropping. Now I have to “Make America proud”? We got to the La Fouly aid station, 67 miles complete and ahead of cutoffs by about 30 minutes or so. Then the minute I crossed the timing mat and came into the aid station tent a large screen cued up and played the first of two videos of encouragement my friends had made for me! The first was from my MARC group (Metro Atlanta Running Club) and then another from GUTS (Georgia Ultra Trail Running Society)! I literally stood still right in the middle of the aid station and cried. In the first video, I saw my friend Cherie. Shortly before I got into UTMB, Cherie was diagnosed with cancer. She would have surgery and undergo 6 months of chemo treatments while I trained for UTMB! I dedicated my 2018 year of running and my UTMB race to her. She has never given up, and the moment I saw her on the screen I knew I wasn’t giving up. Mont Blanc and I would fight this out to the end. Somehow, some way. I had no idea how, but I was going forward. I was going to make all the people cheering for me and my family who made sacrifices for me to be here proud! I would know that I dug deep and gave it all I had. Once in my life I had to quit something. I was in middle school and came from a broken home. Back then, no one came from a broken home. I was shy and struggled to belong but eventually found a place where I fit in when I made the basketball team. I mostly sat the bench but that sense of belonging meant everything to me. Then my mother made me quit the team when one of my grades slipped below a C average (the coach’s history class nonetheless). That was the worst feeling in my life. I swore I would never quit anything again. I often wonder if that was the defining moment in my life and from where I draw strength. We now had some downhill and uphill getting to Champex-Lac. There’s always more uphill! We again got to our crew and knew we had survived to fight some more. During that section it had been Stephanie’s turn to hit a low point. She was tired and hungry but we knew we had to keep going. Just KFM! Keep your feet moving! The next climb was rough for her and she began throwing up. We didn’t dare talk about it, but we both knew this could end things for her. When we finally got into Champex-Lac, mile 76 or so, Stephanie said she had to lay down. We didn’t have time to stay long but Steph needed to recover. Here the crew had more access to the aid station supplies (later in the race they were more relaxed) and allowed both of us to sit and take care of small things. Our crew waited on us bringing food, drinks and refilling our packs. We still had 30 miles to go with a number of mountains to climb. Extreme fatigue and mental exhaustion had swallowed us up. We could only focus on the next little section. Rob would continue to tell us the hardest climbs were behind us. Maybe looking at a chart it looks easier in the second half of the race, but after so many miles and so much time each step is more and more difficult. Hydration was never a problem for either of us. We drank well and it wasn’t really warm until the final afternoon so we both stay well hydrated. Eating became a little tougher. I personally loved the aid station foods; cheeses, meats, crackers, soups, and Coke, which was usually nice and cold, just how I like it. The difficult part was we had to constantly stay moving. We knew we could not relax and sit at the aid station. We had been given lots of advice not to spend too much time at the aid stations. It was amazing how many people did just sit or sleep at the aid stations, or just didn’t seem in any hurry to leave. The problem with grabbing food and eating on the go was that we had gloves on and poles in our hands all the time. We couldn’t put our poles away because immediately out of most every aid station was a steep climb. You also couldn’t really eat and climb. When you would eventually get to a place that leveled out some, you still were using gloves and poles, and it was such a hassle to get anything out of your pack. Even stopping to put on or take off a jacket was a huge ordeal and we just couldn’t afford the time. Stephanie’s stomach started to rebound, but she was so exhausted. It was very early in the morning on our second day and we were again finishing a very long, steep, unending climb. Climbing felt more like a pilgrimage than a large conga line at times as we literally journeyed over mountains from one town to the next with the same group of people. We knew them all by sight and each one was desperately trying to get to the same place. We got to the next aid station, a rustic Refuge at La Giete, just before the sun came up. It was small and people were sleeping everywhere. There was no real aid, just water and coffee. Stephanie laid down on the hard wooden floor and covered up with an emergency space blanket. I gave her 10 minutes to sleep as I anxiously watched the clock. We had another 5k to get to our crew at Trient. Luckily it was a downhill section, although even these downhills were not very runnable. I wanted to give Steph a chance to sleep but not too long. I got out her weather pants and warm jacket from her pack. I was getting cold myself just sitting and trying to sip on very lukewarm coffee. This was not the cappuccino I’d enjoyed in Chamonix the days before the race. I put my warm layers on as well, made Stephanie a cup of coffee and got her up. She put on her layers and we were soon on our way. Steph had rebounded some more and we were desperately trying to put some time in the bank on this next downhill stretch. Bam, we had made it to Trient, around mile 86. Our crew again gave us food and refilled our packs with water as we briefly sat down. Rob gave us our update of what was ahead. The worst climbs were over he said again. Again, all lies! He also told us if we could get through the next section, around 8-9 miles, we would have no more cutoffs. They would let us finish. We were so exhausted and stressed from chasing cutoffs but felt sure we could make it now. The climb from Trient turned out to be one of the steepest climbs we had done. It was now daylight and warmer. We had finally changed into shorts and taken off our jackets. Eventually we got over the top of the mountain and started down a good downhill section on our way to Vallorcine and what we thought to be the last cutoff to stress over. The first thing Rebecca said to us when we saw her coming into Vallorcine at mile 93 was that Rob was mistaken. There was another cutoff. We were no longer surprised, but we were determined with only the last 13 miles ahead of us. We might have welcomed missing a cutoff earlier, but now we were too close and had come too far. We were now on a mission to get to the next check point with more time in the bank as we headed into the final climb. The last climb turned into a climb, then downhill, then another long climb. The worst part would be the most technical boulder and root-filled downhill you could imagine. There was simply no way for any of the runners to move fast. Our goal was now set on la Flegere, the final Refuge and aid station, as well as the final cutoff. Rob had told us if we missed the cutoff they would still let us finish but we were not letting that enter our thinking. We were making it and not missing a cutoff. We came out of the woods from our long climb and could see the la Flegere Refuge way above us and a long steep trail of runners leading the way up to it. We could make it! We entered the aid station with around 25 minutes to spare and went right through and kept moving. Only 8k to Chamonix and the finish line was waiting for us below. We both shed a tear of relief seeing Chamonix below, but knew it was too premature to celebrate just yet. It was the longest 8k – too technical to run at times but we continued to run when we could and just kept moving. KFM – we knew it too well. We knew the clock was ticking and we knew we were finishing but we were determined not to finish over the cutoff time. After a very long downhill we finally dropped out of the woods and onto the trails on the outskirts of town with huge, excited crowds everywhere. Mont Blanc is a majestic mountain to respect! One that humbles you, breaks you and forever changes you! This race isn’t hard to sum up in just a few words. I’d probably use the word Majestic to best describe it. If you have never been to Zion National Park, this is definitely a race to add to your bucket list. If you aren’t a 100 mile runner, no worries! They have a 100k distance as well as 50k, and even 1/2 marathon – something for everyone. The views are breathtaking and the 100 mile race gives you a 34-hour cutoff (which is definitely needed) if you want to enjoy the scenery and take it all in. Two years ago I ran the Antelope Canyon 50-miler and visited Zion National Park for the first time. I knew I wanted to come back and run the Zion 100. It’s a Western States qualifying race, and while I’m on my journey to eventually run WS, I want to run some of my bucket list races, also. I like to see new parts of the country and enjoy each race, and this was a good year for Zion to fit into my schedule. I signed up in the fall of 2017 when I got early signup pricing, still months before the WS lottery drawing for the 2018 race. I chatted with my coach at the time about signing up for Zion not knowing the lottery outcome. We decided that I could always drop back to the 100k option or defer my entry (they are great about giving you lots of options). I tried to convince a few friends to come run it with me, but couldn’t seem to get anyone to jump on board, so this was my race and I was running it because I really wanted to do it. My favorite running buddies, David Yerden and Rich Higgins, both agreed early on to crew and pace for me. I also wanted my husband, Ed, to come, but because our son was not on spring break it was just too rough for him to miss school or not have Ed at home to help him. Our son has challenges with school and I simply could not run ultra distances and races if it were not for the support of Ed! He may not get my “crazy” but he always supports me and I work hard to balance home and running. It’s not always an easy thing, and often puts a huge burden on Ed. Bless his heart! The Zion 100 race has a Friday morning start. That meant leaving Atlanta on Wednesday, flying to Las Vegas and then driving to St. George, Utah, which is 30 minutes from the race start in Virgin, Utah. The small town of Virgin is barely a speed bump in the road, and you would miss it if you blinked. The race itself is not in Zion National Park, but just about 30 minutes outside the park. The race organizers were very clear about this in the literature for the race. Most ultra runners understand that NO race can take place in a National Park or on the Appalachian Trail (AT) for us East Coast runners. The views, the scenery, and the beauty of the area was on display even outside the park, however. Leading up to Zion, I had a slight cough, probably due to the high pollen season in Atlanta in the spring. I didn’t have a sore throat or any other signs of being sick, but a rather annoying cough. At least 10 days out from the race I started taking Allegra and Ziacam to alleviate the cough. It did seem to help but I knew either way, it wouldn’t bother my running ability. Early on Friday morning, we loaded up our rental car and headed to the race start. The weather wasn’t ideal as it was lightly raining, and the forecast was showing rain for a good bit of the day on Friday. I’ve run enough races in the rain, so I wasn’t at all concerned about that. We listened to a last minute briefing from the Race Director and then started the race right on time at 6:00 a.m. It started with an easy road, then trail, section that quickly led to the first climb of the course up to Smith Mesa and the Flying Monkey aid station. It’s a rough, paved road climb so while it’s a little slow going up, it didn’t feel terribly steep or bad. It was nice to chat with others around me and settle into the long race ahead. At the top, we were quickly onto the trails, which would normally have been an awesome, very runnable and easy section, even in the early dark hours of the race. But due to the rain, it felt like you had 20 lbs of clumpy clay mud on each foot. You literally felt the weight of it with each step, and this thick, slippery mud was not the kind that kicked or came off easily. Just as I was settling into the start of a nice race, I had to decide how I was going to navigate this trail and terrain. How long would this last? How long could I fight this mud, the slick sections, and the weight I felt on my feet? On top of that, I was already feeling a little off, physically. Nothing felt really bad, but I just felt “off.” Maybe it was the medicine I had been taking. I had that foggy feeling in my head. Later, I thought it also could have been due to the first climb up to the highest mesa of the race. Possibly the altitude was affecting me? I just knew it was way too early to be on the struggle bus and I wasn’t sure I could fight the mud and my foggy head for the next 90 miles. This wasn’t going to be pretty. Just as I was starting to feel a little defeated and unsure of how things might play out, my friends, Tony and Kathy (who were the only 2 people I knew at the race and they were running the 100k distance) caught up to me. It was so nice to see them and just have friends around for encouragement. I was determined to stick with the two of them to get me to my crew and pacers later in the race. We were soon at the second aid station and headed off the mesa towards Dalton Wash aid station, where I would see my crew at mile 18. As soon as I started descending I began to feel better and the running was much easier without all the mud. Things were looking up! I had gotten ahead of Tony and Kathy coming off the mesa, but they quickly caught back up and we came into the aid station together. I don’t remember what I ate at this aid station, but the important thing was drinking Ginger Ale that my crew had for me. My stomach felt “off” from the very start and I wanted to be proactive in settling things down. I handed off my lights and got a dry pair of gloves to try and stay warm. I left the aid station with Tony and Kathy, while Rich walked me up the road to let me try and drink more Coke before he headed back. This section was another hill climb on dirt road. We ran a good bit at first because it was more of a gentle climb. Tony and Kathy were moving stronger, but I worked to keep up. I was trying to hang on to them for dear life, hoping I could just get pulled along. The top of the climb was steep, but at the top we arrived at the next aid station. This was Guacamole Mesa, and after the aid station we had a 7.5 mile loop and then we would head back down to our crew again at mile 33. One thing that seemed to always taste good to me during this race was oranges. They had lots of fruit choices and the oranges just seemed to be a winner for me. It wasn’t the calories I needed, but it was something that worked. As we left that aid station, Tony asked if I wanted some of the broth he was carrying in a cup. That sounded good and it was also warm and soothing. The weather was still rainy and it was getting to be annoying. The mud wasn’t an issue at the top of this mesa, but there were endless puddles of water and many rocky sections. Tony and Kathy eventually slipped ahead of me as I fought to pull things together and tried to keep moving. I think Tony and Kathy were just on a faster pace because of running the shorter distance, and I knew I needed to take care of myself and run my own race. After the broth had a chance to settle, I began to perk up and for the first time in nearly 25 miles I was beginning to feel better. My stomach still felt rough (and it stayed that way the entire race) but with something in my stomach, I felt better. I stayed with a guy named Vic for the rest of the miles back into the 33 mile aid station where I saw David and Rich for the second time. Vic said if I left the aid station before him, he’d catch up to me, but I didn’t see him again until we saw each other on an out-and-back section 44 miles into the race. Feeling a little better this time in the aid station, my crew insisted I eat more, and I did. We walked to the car and I sat for a minute and drank more Ginger Ale and ate a whole PB&J sandwich. The more food I ate, the better I felt, although my stomach never felt great. Rich again walked me out of the aid station, letting me drink a cold Coke and getting me to the turnoff for the next section. I was now at mile 33, and I wouldn’t see them again for 23 miles, where I could pick up one of them to pace me. The toughest climb of the course was just a few miles ahead of me. This is where not fully knowing the course might have been a good thing. I was able to move well on the downhill’s and flat sections of the course, but I saved myself and hiked most of the uphill’s. The steep climb up to the Goosebump aid station was almost enough to take out the toughest of runners. It was extremely long and very steep, with the trail getting rougher and rockier with each step. The top section was hardly a trail but more like a boulder field climb (some exaggeration here, but that’s how it felt). When I say the climb was worth the view, I can’t even begin to describe the beauty this course showcased. While my stomach didn’t feel so great for most of the race, I didn’t fail to take in the views and enjoyed every minute of the course. I tried to run in the moment and focus on the scenery surrounding me. Some of my favorite running is single track technical, and the rocks and sections on top of the mesas offered me trails in my ultra happy place. Nearly 18 miles of running across the hard rock surface began to wear down my legs, however. It was almost like running on pavement, but I was eventually back to the Goosebump aid station and headed towards my crew and pacer. It was starting to get dark and I ran as much as I could to try and get to my crew before having to turn on my headlamp. They were able to meet and crew me about a mile before the next aid station. After taking care of a few things, getting Ginger Ale, changing into warm dry clothes for the night, switching to a smaller pack, and picking up my poles, I was off again, with Rich pacing me. The next aid station was 1.5 miles away and for the first time in the race I sat down here for a longer time. I drank a couple of cups of Roman Noodles and broth, ate some bacon (which for the first time in the race didn’t make me want to throw up just smelling it) and after feeling much better I was off for a 6 mile loop with Rich leading the way. Rich set a good pace, and we moved really well. The last part of the loop was a lot more technical and hilly which slowed us down (ok, I slowed us down). Even at night you could see the beauty of the course. We went through the aid station, saw David again at mile 64, and then headed off for a fairly long section before we’d see David again at mile 76. Rich was with me this time as we came down the long steep climb I had gone up earlier in the day getting to the Goosebump aid station. I tried to tell him how tough it was and I’m not sure that even going down you could grasp how tough it was going uphill. I was really happy I had my poles to give my legs that extra support going down. It was then another 7 miles through the desert to get to David at the Virgin Desert aid station at mile 76. It seemed like moving through the rolling hills in the desert at night took a very long time, but we were passing lots of runners and moving really well. Just before getting to the aid station, I got really cold. The desert night had brought down the temperature and because I was slower and sleepy, I began to get very cold. As soon as we got into the aid station, I told David I needed to get into the car. He tried to get me to warm up by the fire, but that’s a no-no for me. It would warm me up, but I’d be way too cold after walking away. In the car, I put on another jacket, long pants over my shorts, and also put on a beanie hat. I drank a little more and I was off to tackle the first of 3 loops that were based out of this aid station. The loops were 5, 6 and 7 miles long. Rich lead me on the first loop where we were able to get into a good running pace, again passing lots of runners and moving pretty well. I warmed up quickly at this pace and soon took off the extra jacket. David began pacing me on the second loop, now at mile 81. It was longer and more technical than the first loop, so we were a bit slower this time around. We were again passing more runners and kept moving along. For the first time during the race, I began to eat sugary treats to pick up my energy – Skittles! I love almost everything about Skittles although they are harder to chew when they’re cold. David also started giving me Tums when he began pacing me to see if that would help my stomach. It seemed to work a little but wasn’t a totally winner. As we started the final 7 mile loop, the sun was up, and we were able to turn off our headlamps. That always seems to pick up your spirits as the new day breaks, and of course seeing the sunrise was beautiful. This loop had some spectacular canyon views below us and was easily the prettiest of the 3 loops. We saw Rich one last time when we finished this loop, and we had 5 miles left to the finish. I took off my long pants, my gloves (which I had worn the entire race), switched back to my trucker hat and put on my sunglasses. It was the home stretch and I wasn’t slowing down. This last section had lots of gentle downhill running, then a short climb up to the road, where it was 1.5 miles to the finish. There were more runners around us now as the 50k and half-marathoners were coming in on the same trail to the finish. We managed to pass a few more people and David did a great job keeping me running all the way to the finish. I had high expectations of finishing this race between 26 – 28 hours. That goal was sort of thrown out early on with the mud and my stomach issues, so I tried to enjoy the course and finish strong in the end. David said I could get in under 29 hours, so we continued to run as best as I could. When I crossed the finish in 28:47, I was more than thrilled. A 100 mile finish is always sweet! The race has a 34 hour cut-off and while I was well ahead of that time, the day was beginning to warm up, so it was nice to be finished! You get to pick your own buckle, as they are all custom made and each one is different. I sat down, took off my shoes for the first time, and enjoyed watching others finish and feeling the warmth of the sun. Tony and Kathy showed up before we left the finish area and it was fun to see them again before we headed back to our hotel for a shower and some rest. I can say the race was very well run and had great volunteers! Each aid station had lots of food, plenty of water and supplies. It’s a “green” race, with recycle bins and compost toilets at each aid station which can be very nice to have, especially when you have 100 miles of stomach issues. My crew wasn’t a fan of the compost toilets and were not disappointed to bid them farewell when the race was over. No matter what may have gone wrong in this race, you would have missed out had you not stopped a moment to take it all in and enjoyed the views and surroundings. Truly a majestic place to run, no matter what distance is your jam. If you live in Georgia and have been an Ultra Runner for at least a little while, you’ve probably heard of the Georgia Loop. It’s basically just that, a looped route that connects the DRT (Duncan Ridge Trail), the BMT (Benton MacKaye Trail) and the AT (Appalachian Trail). It can be done in either direction and has about 3 main easy access points where you can start and finish. The mileage of the loop is approximately 56-60 miles and around 16,000 – 18,000 feet of climbing. Because the mountains tend to be cold and snowy in the winter, and hot with little water in the summer, the time of year and weather are critical factors when making your plans. There was a lot of chatter on Facebook and among local ultra runners in the last two months of 2017 about putting together an attempt at the Loop. These types of things usually start with a large number of interested people, but then slowly dwindles down to just a few who can stay committed and get it on their schedule. In my case, I piggy-backed off others who had people committed to crewing for them. There are not many places a crew can actually help you, but it is still critical to have crew you can meet at a few important points along the way. Essentially, you need to be a runner who feels comfortable running 10-15 miles with no help or crew, which makes those few crew access points very important. Think of it more as a self-supported run with potential crew stops. Ten runners ended up starting. One solo runner with a pacer, additional groups of 2, 3 and 4 runners, with only 5 of us finishing. I started in a group of 3 with Rich Higgins and David Yerden. We dropped our cooler with supplies and other items to “our” crew, Jason Anderson, just a few hours before heading to the start. In case you are wondering what I packed, just about everything! And then I packed some more, because “That’s How I Roll”!!! If you know me, run with me or have ever crewed for me, you might be familiar with my infamous “notebook”! I like details and to cover all the bases. I might be a little OCD, but I’m not admitting to it. This was just a training run or adventure run, so there was no notebook, but I still packed every possible item and a back-up, filled my cooler with Cokes, Ginger Ale and lots of snack options. You never know what you might need or what’s going to sound good at the moment. In the end, usually nothing sounds that good to me except a nice cold Coke! I filled the cooler with supplies for the three of us and dropped it off with a bag of extra clothes, shoes, lights, and other items I probably wouldn’t use. Rich and I drove up to Dahlonega together and met David so we could get a good meal before starting our run. We dropped in at Dahlonega Mountain Sports to say hello to Sarah and Sean, the store owners. Go visit them if you are in the area, it’s an awesome store and be sure to tell them I said hello! Sean shared with us his experience running the Georgia Loop the year before, and while he mentioned the suffering, my mind played down that part. I would soon remember his words to the wise, which I wasn’t wiser for until I experienced it myself. On our way to the starting point, we stopped at Woody Gap to stash a supply of water. It was our safety plan if for some reason crew couldn’t get to us at that point. We knew we would need a water refill for the last 9-10 miles of the run. Our starting point was Wolf Pen Gap, where we could park cars along the fire road and run the Loop in a counter clockwise direction. Going that direction put us on the toughest section of the DRT first, then the BMT, and finally the AT, with a short section of the DRT at the end to get back to Wolf Pen Gap. There were only two major turns on the course, but they were critical turns with no flagging. You can run this totally unsupported if you want to drop water and supplies along your route beforehand, but it takes about 4 hours to drop everything off, you need to use bear canisters for your supplies, and it takes 4 more hours to pick everything up afterwards. Probably not a good chance to get a cold Coke either, so that’s why we decided to use the help of a crew. We got to Wolf Pen Gap, got ready to go with a final check of our packs and headed out at roughly 7:10pm. It was already dark, so our headlamps were on from the start. If you’re familiar with the route, you know it’s pretty much a climb from the very start. It was exciting, just like at the start of a race, and the adrenaline was really going at this point. It was exciting because it was new for all of us, and it was a bucket list run we were doing. Quick Photo before we start this thing! So now our team of 3 was only two. We felt terrible for David, but knowing he would have been there if he could, we added him to our list of people we were running for. Their strength pulled us through at times when we had none ourselves. We had about 11 miles to go to get to Hwy 60, or as it was called “The Highway to Hell Aid Station.” Our crew wouldn’t be at this stop, but we would see crew from the other groups and get some water and snacks if needed. The climbs across the DRT seemed long and endless with each mountain higher than the one before. Most runners call the DRT the Dragon Spine. Straight up, straight down, with no switchbacks. If the steep ups don’t wear you out, the steep downs will get your quads, your toes, or both! For Rich and I, the steep downs seemed to do the most damage to our toes, getting smashed into the end of our shoes. Before we got to the DRT/BMT intersection our toes were in pain, and running steep downhill’s was going to be rough. The steepest of the climbs gave way to some easier trails for a few miles. We caught up to one of the early groups about a mile and a half from the Highway to Hell AS, and then came into the AS just after the first runner had arrived. Except for our toes, we were feeling pretty good at this point. We refilled our packs with water, taking note that we had not been drinking enough. We needed to do a little better at that. We both drank a cold Coke and quickly headed back out to continue the journey. It was 2:00 a.m. when we left Highway 60, (about 19 miles into the Loop) and we would see our crew again around mile 33-35. We both had our headlamps with one set of batteries as a backup. While the climbing did not get easier, we enjoyed the moon that was out and the awesome temperatures for a February night in the mountains of Georgia. Not too long after crossing the Swinging Bridge over the Toccoa River, my headlamp started to fade. I knew I had an extra set of batteries, but we also knew I only had one extra set. Depending on how long the new set would last, that was it. We had no crew, no AS, no help. So I pushed on as long as I absolutely could before putting in the backup batteries. Next it would be Rich’s headlamp starting to fade. He pushed through as long as he could on the first set of batteries, also. Rich had also been dealing with leg cramps in the last few races we’d run. Somewhere between miles 25-30 the cramps hit him. Being a training run, Rich had purchased some highly recommended Hot Shots to try out for the cramps. He had taken one before the start (as directed), had one in his pack and one with our crew supplies. They are fairly expensive but Rich felt it was worth a try. Soon he was stopped in his tracks with a painful leg cramp. Sure enough, the Hot Shots almost instantly took his cramp away and we were off climbing again. Rich was now very cautious on the climbs, because he felt the strenuous climbs set off the cramps and we had no more Hot Shots with us. We would have to pick up the last bottle when and if we saw our crew again. It was a long dark night and then rain came. It was a light rain at first, but eventually we had a good hour of fairly heavy rain. We had our rain jackets on to keep us dry and comfortable, while we continued making our way with frustrating headlamps on what seemed like constant uphill climbs. Without David, one thing that could go wrong was a missing a turn or taking a wrong turn. We knew our way and we knew the directions, but you know how “ultra brain” and “ultra fog” can affect you. In our pre-adventure planning, one thing I did was mark our course using the AvenzaMaps app on my phone. We would not need a cell signal to use it, and could easily see where we were. When we came to the big open field we’d heard about at the southern end of the BMT, we had no idea what way to go. We wandered a little aimlessly in one direction by following hunter tacks, but once I pulled out my phone we realized we were totally off course and headed the wrong way. Having to climb back up a hill we just went down, we were soon back on course, and the crisis was averted. Best money ever spent, and best advice received from the Duffer, AKA Brad Goodridge, who I might say is a local legend and the best source of information for doing the Georgia Loop. Thanks, Buddy! Finally day light and our crew! We made the left turn at Long Creek Falls shortly after that and were now on the AT. But we didn’t know where or when we would see our crew again. It was a bit of a mind game that can get to you when you’ve been up all night. Otherwise, we were still doing well. Our feet were still sore, but we were feeling pretty good as the light of day began to break through. At this point, I’d managed to kick so many rocks in the dark, over and over again, that I was sure my big toe nail was no longer attached. Toe nails are for sissies anyway, and this stuff is not for those folks! We knew we should see Jason, our crew, somewhere around mile 33-35. He told me he would be at Hightower Gap, although others mentioned different places, and we just resigned ourselves to the fact we’d see him eventually, but not knowing exactly where that would be. We did need water and hoped we’d see him sooner rather than later. Finally, as we began to drop into the Hightower Gap parking area, we heard calls and cheering! What a welcoming sound that was! But we didn’t expect to see Thomas there, as well. Thomas was part of the group of 4 runners we had left behind at the Highway to Hell Aid Station. For them, their hell ended just a few miles later when one of the runners who had been having serious stomach problems since mile 8 decided it was time to call it quits, and they were all in or all out together as a group. Regardless, we were happy to see a familiar face, and our gear bag and cooler with ice cold drinks in it! Thomas even had sausage and egg biscuits from McDonald’s for us! All was right with the world, for a few minutes anyway! We made it a short stop and were soon on our way. I think we got to this point some time early in the morning shortly after the sun came up, maybe between 7-8am. We were now working our way across the AT towards Blood Mountain, but unfortunately there were several mountains to climb before we got anywhere close to Blood. Being on the AT in daylight gave us some spectacular views! The top of each climb was always rewarded with an awesome view and we didn’t fail to grab a few pictures along the way. Jason was able to crew us a couple more times along the way and we finally got to Woody Gap, our final crew access point around 1pm. We refilled our water and headed out. We were in the home stretch, but 9-10 miles is still a long ways from home and now every climb and every step just hurt. We were ready to be done. We might even have entertained the thought of quitting, but there was nowhere to quit. Rich told me later that in some of the final miles he had thoughts that someone was going to have to come get us. But there were no access points, no help available. He said he knew that, but figured they’d send a helicopter, drop a basket or something! The things some people think of! It was definitely a very long stretch from Woody Gap to the turn onto the DRT! I have run that section to Blood Mountain before, and was looking forward to a familiar easy section, but right then there was nothing easy about it! We enjoyed a beautiful view at Preachers Rock and ran into one running buddy coming back from Blood Mountain, but aside from that we were on the struggle bus and just wanted off. We finally made it back to the DRT and knew then we were very close, but not before climbing just one more mountain! Worse than climbing up that mountain was the very steep downhill on the other side of it, dropping us back into Wolf Pen Gap and the car! The sight from the top of the last hill dropping into Wolf Pen Gap was bittersweet. We had been anticipating the view of the car below for hours. We knew we had made it, completed a bucket list item, and finished something only a small list of people complete in a day’s journey. But darn it all, that last hill was steep and my toes were killing me. We officially finished in a time of 22:04! We didn’t care about our time, but some of you might be wondering how long it took us. Afterwards we waited an hour for the second group of 2 runners to come in. John and Scott started about 30 minutes after us the night before, and all day we expected them to catch up to us. We all shared stories and took a group picture as we waited for the final runner to come in with her pacer. In the end, we decided we needed to head home because we didn’t know how far behind us she was. It was getting dark again and we were very sleep deprived. It was a great training run and a fantastic experience! Ten of us started and 5 of us finished! Those who didn’t finish will no doubt be back to try again, and who knows we might even consider another run at it, but not anytime soon. If you plan to do the whole loop at one time (without support)…. You need to put aid out the day before the attempt (Wolfpen, Mulky, BMT/60, Hickory Flats, Hightower, Cooper Gap). Food In ammo cans (Bears) (there is ZERO water on the DRT). Takes ~4 hours of driving to put aid out. 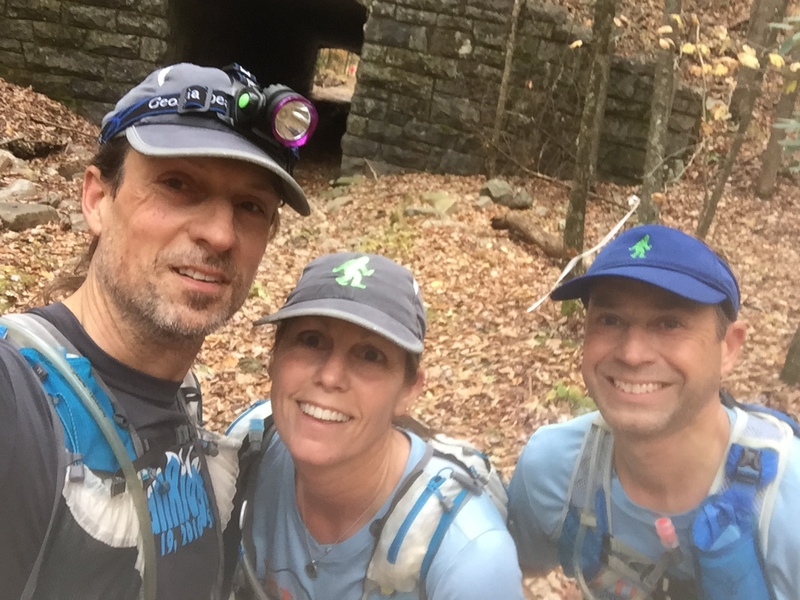 You should also do section runs before you do it again (can be tricky between big bald and Hightower (there is a turn at Long creek falls) when you are tired in the middle of the night). The last 3.5 miles from Gooch Gap to Woody is a killer (you will want to die). The easiest place to start is Woody Gap on GA-60 CCW. You can also start at Wolfpen Gap (near Vogel off of SR-180). Some people like to start at 3 forks, but that’s a hour drive on forest road drive and a mile from the AT/BMT (depending on the direction). Same with a BMT/60 start. The DRT blue blazes turn into BMT White Diamonds on the top of Rhodes mountain (DO NOT right turn like the GDR or Crewel Jewel Course). These are all places you can drive to. This is one of those historic and iconic races that most ultras runners who have been running for a few years have heard the name of. David, my regular running buddy shared with me back in the spring that he wanted to run this race and knew it would be a challenging one. If it would be a challenge for him, I knew it would definitely be a serious challenge for me. I signed up for this race when it first opened but it wasn’t my main focus over the summer and fall as I had other big races I was more focused on. I had spent months working hard with my coach on speed work, hill repeats and core and strength workouts. So I went into Mountain Masochist (MMTR) feeling stronger than I have ever felt and totally ready for the challenge. The trip to Lynchburg, Virginia for this race was 7 1/2 hours long drive and there were five of us runners from Georgia who decided to jump into the race. All of us knew that to make the tight cutoffs we would have to be having a great day and manage ourselves so the wheels didn’t come off later in the race. I honestly didn’t spend a whole lot of time researching the race, but during our trip up, I got lots of information from the others who had done more reading about it, along with Janice Anderson, who was one of the runners with us. What makes Janice such a good source of information? Well I guess not much more than the fact that she has won top female 4 out of 7 times that she has run it. Those were more in her glory days of an elite runner, but with a 35 year old race such as Mountain Masochist not much of the course had changed. We had more fun talking with Janice about what it was like to run “back in the day” when they didn’t have packs, much less water bottles, and fueling for a race was quit the challenge. There was no internet, cell phones or UltraSignup back in those days, and going to races and receiving Ultra Running Magazine in the mail was their only connection to other runners across the country. I felt like a pampered runner with all we have, and no matter what happened the next day on the course, I knew in my heart the true badasses where those runners from years gone by. That’s what Mountain Masochist would symbolize for me. It’s a little odd when you go to a race and don’t know a single other runner than those who came with you. This race screamed deep history from the very beginning. 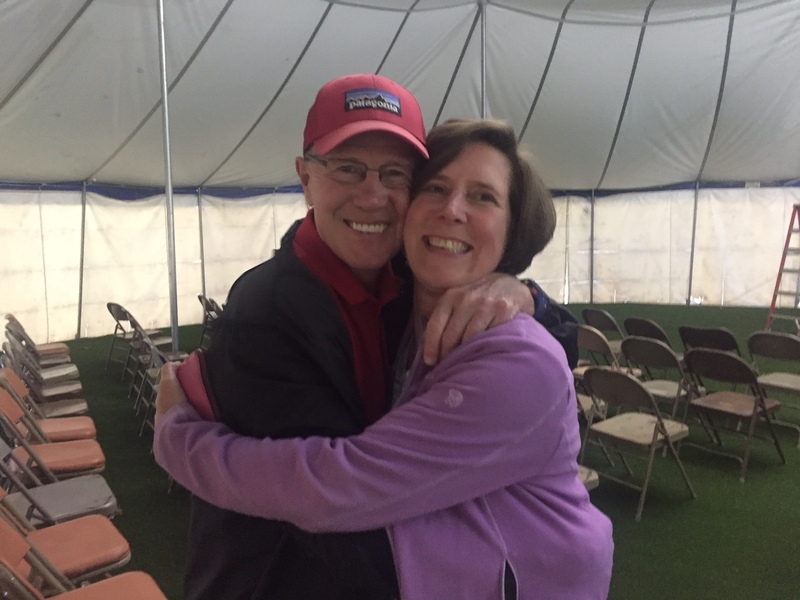 Janice immediately knew the first person she saw as one of her old running friends, and then she received a huge welcoming hug from David Horton (original Race Director of MMTR). I sort of felt like I was a bit of an outsider just looking in on the old years gone by in Ultra Running, I felt a little out of place. You know how us runners look around the room at packet pickup or pre race dinners and kind of size up the other runners. I don’t call them competition because for me it’s just others who are running and I am no competition for them. I made two fairly obvious observations, 1) there were not many woman who took on this challenge and 2) even the guys running it all looked like very serious and tough runners, as did the women! These were some true Beast Coast runners! This wasn’t a fun run in Georgia where everyone shows up to have a good day together and everyone finishes no matter how slow a runner you are. All that being said, I felt more than ready for the challenge. The five of us who came up from Georgia were staying in a large cabin we rented that turned out to be just minutes from where the race ended and where we would catch a shuttle to the start. After our pre race dinner and getting to listen to guest speaker, Scott Jurek, we headed back to our cabin for the night. We had to get to bed early to catch our 4:15am shuttle ride. The time in the morning seem to go by fast, from getting up, to taking the shuttle and once again checking in for the race start. It seemed before we knew it, at 6:30am and in the dark hours of the morning the race started. We were quickly on a paved road for about a mile and 1/2 before dropping onto a nice trail that was very easy to run. Rich, Tony and I all settled in together for our run. Before we were too far into the race David would come by us, so we knew he was in front of us, where we expected him to be. Janice we had passed on the road section but we all run fairly close to the same pace and didn’t expect her to be too far behind us or for long. We spent the dark hours before the sun came up on rolling trails that crossed creeks, had some climbs but nothing at all crazy. I had the sense that once it was light out, the scenery would be beautiful and it certainly didn’t disappoint. The first AS was one of the furthest at roughly 7.6 miles and it seemed to come up on us fairly quickly. We all grabbed something quick and kept moving. The next section started with a climb on what we might call a fire road but they are much smoother than the fire roads in Georgia and covered with taller grass so it seemed really like a section of single track. AS began to come up on us quicker and the next one was just 3.7 miles away. The weather was cooler, and although we had all taken off our jackets, we weren’t going through our water too fast and needing refills, so AS seemed to be rather quick to get in and out of. Our pace felt strong but it seemed like no time and we had come through an AS with a good 2.25 mile climb to the next AS on road. While Rich and I continued to climb as steady as we could, Tony began to struggle in the climbs and fell behind. When we reached the top and the AS we found we were just 6 mins ahead of cutoffs and only around 16 miles into the race. This isn’t how I wanted the day to go but chasing cutoffs looked like the Mountain Masochist way! It was a good 2.5 miles of downhill that we were able to open up on and run at a good pace and gain a little time coming through the next AS. Fall Colors were so beautiful! Rich and I had not been able to wait for Tony and now were not sure if he and Janice who were both behind us had made it through some of the AS and cutoffs. We knew we were running close to cutoffs ourselves, but continued to run strong, climbing hard and running a fairly fast pace on the downhill’s and flats. We came into the mid-way AS at mile 26 with about 10 minutes before cutoffs. This was a drop bag point, but we chose not to drop any, and probably would have had little time to mess with them if we had. A drink of Coke and on we went as quick as possible. The course was a lot of gentle roads with unbelievable scenery. I had my phone but could only bring myself to take it out a couple of times to snap a few quick photos. Soon it began to rain. At first it seemed more drizzly but before long turned into a real rain that was cold. Before I got soaked I went ahead and put on my jacket and even put my gloves back on just to stay warm. I didn’t feel like the rain made the course a mess because the roads seem to handle the water well. It was a another long climb into the AS, that was the start of the “loop” which was about 5.3 miles, although lots of people say it more like 6 miles. We knew lots of people complained about the loop saying it was rocky and technical, and thus far on the course it had been anything but that. The first mile or more of the loop, it was extremely easy running and we started to pass runners and hoped to be picking up some time. It would be the beginning of many runners we would pass. Although as the loop got wetter and muddier it did become harder to navigate at the pace we wanted to be moving. We had a 20 minute cushion coming into the loop so we felt we were still in good shape. Soon we got to an out and back section on the loop, you did a long climb and had to punch your bib at the top before heading back down. We came across David coming back down not long after we had started the out and back section. David was in good spirits and wearing his rain jacket, so I was happy to see him and felt good about how he was doing. He wasn’t far in front of us, but with the amount of people we moved aside for, the rocks and muddy course we definitely lost some time on this out and back section. Once we punch our bibs and started back we came across Janice. She was also doing well and we were happy to see her as well. She had last seen Tony before the half way point and we later learned he missed the cutoff there and was pulled. Rich and I worked our way back down and finished the loop as quickly as we could. It was very rocky and technical as well as some steep muddy and slippery sections, again slowing us down some. Just before coming in the AS off the loop we were told we needed to hurry we were just minutes ahead of cutoff. They tried to get us to eat but also get going because of cutoffs. We thought this was the last “hard cut” but shortly after we got out of the AS we were told by other runners that we needed to keep running at a good pace. They were telling us we had about 20 minute left to get 3 miles. We’ve been running cut offs and back of the pack all day long and quick math, that doesn’t add up for me. We never stopped and didn’t give up for one minute. We were confused thinking once we got about 50K into the race it would not be any trouble to finish. We pushed hard and ran into the AS ready to keep moving when we were told we were done. Our race had ended at mile 42 (although my Garmin said 44.85) missing the cutoff by just 5 minutes! We had done 8,500 ft of climbing and had kept a solid pace of 13:28. I was disappointed to not finish the race but not disappointed with my run. It was a challenge that I would do again. A very well organized race and even offered a very nice shuttle ride of shame back to the finish area! Janice was pulled just minutes behind us, and we all got to the finish just in time to watch David come across the line and finish strong! David was the only one of us from Georgia to finish, and in a small way seemed to offer our DNF’s a little redemption. Rich, David, Me, Janice and Tony the next morning! My DNF (Did Not Finish) was more like, I Did Not Fail to Challenge myself! I didn’t pick an easy race that I knew I could finish, I wanted a challenge! This is the Beast Coast and we are some tough runners here and we’ll be back one day to show MMTR how tough we can be!